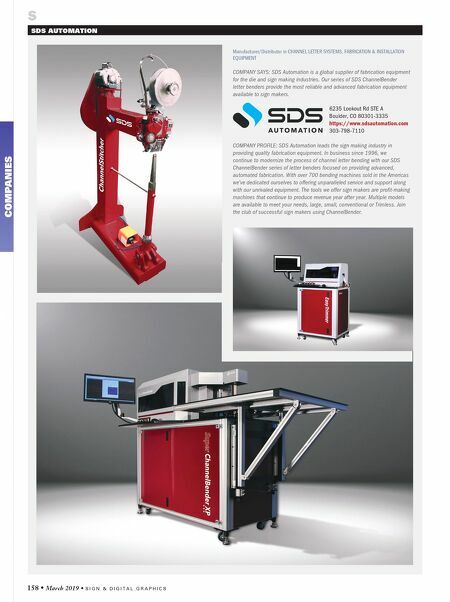 158 • March 2019 • S I G N & D I G I T A L G R A P H I C S COMPANIES S SDS AUTOMATION Manufacturer/Distributor in CHANNEL LETTER SYSTEMS, FABRICATION & INSTALLATION EQUIPMENT COMPANY SAYS: SDS Automation is a global supplier of fabrication equipment for the die and sign making industries. Our series of SDS ChannelBender letter benders provide the most reliable and advanced fabrication equipment available to sign makers. 6235 Lookout Rd STE A Boulder, CO 80301-3335 https://www.sdsautomation.com 303-798-7110 COMPANY PROFILE: SDS Automation leads the sign making industry in providing quality fabrication equipment. In business since 1996, we continue to modernize the process of channel letter bending with our SDS ChannelBender series of letter benders focused on providing advanced, automated fabrication. With over 700 bending machines sold in the Americas we've dedicated ourselves to offering unparalleled service and support along with our unrivaled equipment. The tools we offer sign makers are profit-making machines that continue to produce revenue year after year. Multiple models are available to meet your needs, large, small, conventional or Trimless. 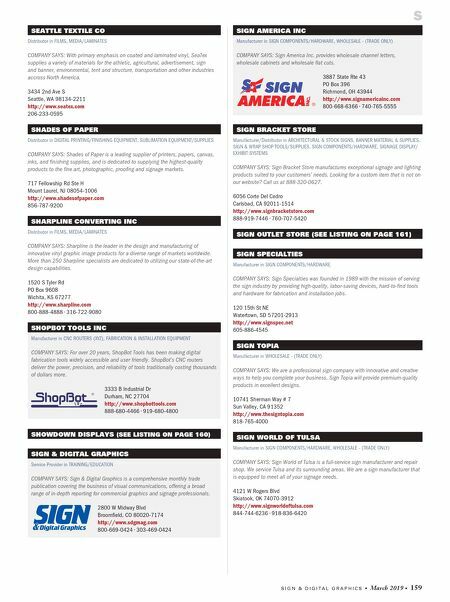 Join the club of successful sign makers using ChannelBender.